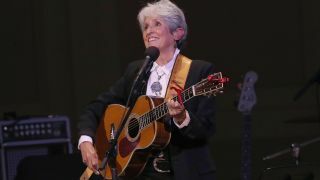 After nearly six decades, Joan Baez says 2018 will be her final year of touring and her new album could well be her last. Dan Hobson chats to the queen of folk on the dawn of a new era. "I am happier than usual," chuckles Joan Baez as she delivers the verdict on her new album, Whistle Down The Wind. "It feels like the beginning for me." Indeed, Baez's first record for almost a decade burns bright with the fiery protest and social awareness that catapulted her to stardom in the 1960s. The album represents another new beginning for Baez, though. It symbolises the start of a new life away from the spotlight. At the time Baez announced the album, she added that 2018 would be her last year of formal touring. "It was becoming clear to me that stuff is winding down," Baez says from her kitchen in Woodside, California. "I wouldn't say that this is definitely the last album, although I imagine that it is. I'm leaving that possibility open in case something happens and I feel the need to put another record out. But my feeling is that this year's tour will be the last. I won't stop singing necessarily, but I'll stop doing these formal extended tours that I have done for the last 55 years." The reason Baez has drawn a line in the sand when it comes to extended touring is, quite simply, her voice. In the past, Baez described her singing voice as a gift which she, very humbly, took little credit for. Now, it seems, the gift that kept giving for six decades is not as generous as it once was. "It's so difficult to sing now, people have no idea," Baez admits. "I remember years and years ago asking a vocal coach how I'll know when it's time to quit. He said, 'Your voice will tell you'. For the first 30 years of my career I never even thought about my voice. Then, all of a sudden, I really have to think the whole thing out each time, which gets tedious. It's a lot of time and a lot of hard work – I think I'd rather be painting," she says with a laugh. Despite Baez looking decades younger than her 77 years, maintaining her voice is a huge daily commitment. "Everybody's vocal cords are elastic to begin with and like every other muscle, you have to keep working them for them to be what you want them to be," she says. "But they'll never be what they were when you were younger. So you start the process of compensating here and there... I work with what I have and I like what I have, but it's still difficult. Especially the upper range stuff." Recorded over a ten-day period at United Recording Studios in Los Angeles and produced by Joe Henry (Bonnie Raitt, Billy Bragg, Allen Toussaint), the album comprises a collection of covers and original songs by legends, including Tom Waits, Josh Ritter, Mary Chapin Carpenter, Eliza Gilkyson, Anohni, as well as lesser-known songwriters like Zoe Mulford, Tim Eriksen, and Eliza Gilkyson. The album, to be released on March 2, will be Baez’s first record since 2008’s Day After Tomorrow. The title track, Whistle Down the Wind, originally written by Tom Waits for his 1992 album Bone Machine, received critical acclaim when it premiered in January. Other highlights on the album include Baez's version of The President Sang Amazing Grace, by Zoe Mulford. Baez's beautiful, crystal clear vocals shimmer over the piano arrangement with expressive lyrics such as “No words can say what must be said, for all the living and the dead”. Last Leaf, by Tom Waits and Kathleen Brennan, also seems a poignant number, considering the context of the record. “I'm the last leaf on the tree, the autumn took the rest, but they won't take me," goes the song's refrain. Josh Ritter wrote two songs for Baez on the record after the pair became close while he was supporting her on tour. Both numbers, Be of Good Heart and Silver Blade, are traditional folk arrangements in typical Ritter style with powerful, image-laden lyrics. Definite stand-outs on the album, Ritter's songs suit Baez's style extremely well. Overall, Baez is very pleased with the record. "There are songs that are very ballad-like. Then there are songs that are, I wouldn't say political, but socially aware. And I wouldn't say protest, but they certainly make people understand there are problems in the world." Baez was born in Staten Island, New York, on January 9, 1941. Her father, Albert Baez, was born in Puebla, Mexico. Her mother, Joan Baez (née Bridge), was born in Edinburgh, Scotland. Baez had two sisters, Pauline Thalia Baez Bryan (1938–2016) and Mimi Fariña (1945–2001). Due to her father's work in healthcare and with UNESCO, the family moved many times when Baez was young, living in towns across the USA, as well as in England, France, Switzerland, Spain, Canada, and the Middle East. Baez's musical journey began after she was given a ukulele by a friend of her father. “I amused myself at junior high school playing that ukulele,” she remembers. "We moved a lot when I was young and I never really got settled with friends; I didn't have a lot of close friends. I found great comfort playing rhythm and blues mainly. It was really soothing for me. Then I found some terrible guitar in the attic and I played that for a while. Then it was getting clear that I was good at the guitar and wanted to keep going so I think I got a Goya gut-string guitar, then a huge Gibson. Ever since then, I've played Martins." In 1958, the family moved to Massachusetts, which happened to be the centre of the emerging folk-scene. That year, at the Club 47 in Cambridge, a 17-year-old Baez played her first show. “Club 47 was like my home in the early days,” Baez remembers. "I really flunked out of college and I wasn't there for more than about a month. My life That's where I had the time to fall in love with that music and the talent to play it." Around that time Baez met Bob Gibson and Odetta, the most prominent artists in the folk and gospel genre. Gibson invited Baez to perform with him at the 1959 Newport Folk Festival and the appearance led to her signing with Vanguard Records the following year. She released her fi rst album, Joan Baez, in 1960 and it sold moderately well. As somebody that has always strived to live in the moment, it never occurred to Baez at the time just how long and successful her career would go on to be. Despite Baez's lack of ambition, her second release, Joan Baez, Vol. 2 (1961), went gold, as did Joan Baez in Concert, Part 1 (1962) and Joan Baez in Concert, Part 2 (1963). From the early-to-mid-1960s, Baez emerged at the forefront of the American roots revival, where she introduced her audiences to the then-unknown Bob Dylan. In 1963, Baez began touring with Dylan and recording his music, a bond that came to symbolise the folk music movement for the next two years. In the late 1960s, Baez began writing many of her own songs, beginning with Sweet Sir Galahad and A Song For David, which both appeared on her 1970 album, (I Live) One Day At A Time. "I taught myself how to play guitar and sing, I think we all did in the coffee shops early on. Saying you didn't have formal lessons didn't really mean anything because copying everybody else was how everybody was learning. I'm sure I could have learned a lot of different techniques, but I just copied others and hoped for the best. "I started writing my own songs about 10 years in. It never dawned on me to write initially. One day somebody said, ‘Why aren't you writing your own stuff?’. So I wrote Sweet Sir Galahad as the first one. And I thought, ‘Well, this is pretty good’ and I just kept writing." After 11 years with Vanguard, Baez cut ties with the label in 1971. She delivered them one last success with the gold-selling album Blessed Are... (1971) which included a top-ten hit in The Night They Drove Old Dixie Down, her cover of The Band's signature song. With Come from the Shadows (1972), Baez switched to A&M Records, where she remained for four years and six albums. While the 80s and 90s were a time where Baez reflected on her place in a musical landscape that often didn’t honour folk, she continued to perform at benefits and fundraisers for social and political causes around the world. She also maintained her recording output with albums like Speaking of Dreams (1989) and Ring Them Bells (1995). Her first album of the new millennium was 2003’s Dark Chords On A Big Guitar, followed up by a collection of live tracks in 2005 on Bowery Songs, featuring tracks by Dylan and Woody Guthrie, as well as traditional folk. Baez was honored with a Grammy Lifetime Achievement Award in 2007 and was inducted into the Rock and Roll Hall of Fame on April 7, 2017. With such a long and illustrious music career, not to mention her activism, it is impossible for Baez to pick a highlight. “Gosh, how could I? There would be 50 highlights, I'm sure,” she chuckles. Baez's 2018 tour is certainly set to be a highlight, though. With shows in the UK, Ireland, Europe, the USA, and with more dates to be announced, it is set to be a monumental and fitting exit for the queen of folk. Can we expect any surprises for the final tour, though? “The surprise is that I'm still doing it,” she jokes, playing her cards close to her chest. For anyone keen to know the secret of Baez's longevity and radiant health, the answer is simple. "It all comes down to that word nobody likes to hear: discipline. Discipline about what I eat, how I keep up physically, meditation, different kinds of stretching and exercise. If you don't take it very seriously it slips – and you slip." Will she ever allow herself a break? "Maybe I'll loosen up a little bit at some point," she says with a laugh. "While I'm still traveling I would like to look a certain way and I would like to have a certain kind of energy and that means that I stick with all the rules I've made for myself. Maybe when I quit touring, I'll let myself go," Baez jokes. "You really can't tell." Somehow, we doubt it. 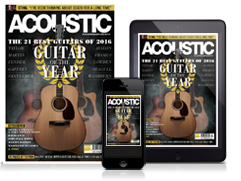 "For the live shows I have two guitars, both Martin 0-45s. My son (Gabriel Harris) plays percussion and a guy named Dirk Powell plays around seven different instruments. A young woman, Grace Stumberg, sings with me on and off throughout the show, which is really refreshing. Some of the high notes that I don't make anymore, she does double on them. "My personal collection is very small, I must have five guitars in total. The two Martins I use are replicas of the Martin 1929 0-45 I bought for $200 in 1962. I hadn't played that guitar for years. Although, I packed it up, bought it a seat on the plane and took it to the recording session for this album and that's the first time I've played it for decades. "An amusing story about that guitar is that when it went in to be fixed in 1996, the repairman took it apart and found a scroll inside which said, 'Too bad you're a communist'. It must have been done by a repairman years ago who disputed my politics. When the 0-45 was replicated for a 1997 edition, a backwards label bearing the same slogan was adhered to the inside of the soundboard so that it could be read with an inspection mirror.